1) Quiet Ride. Thanks to Honda’s determination to improve the noise, vibration and design of previous Fit models, the 2015 will be the quietest sub-compact on the market. In order to accomplish this, Honda added soundproofing material throughout the body, including the floors, ceiling, doors, fenders, instrument panel and center console. 2) Power Machine: The power in the new Honda Fit has improved by 11% compared to previous models, with a 1.5 liter 4-cylinder engine now producing 130 horsepower. Thanks to the newly improved quiet cabin, you can be going over 70 mph and not even realize it! 3) Interior Evolution: With their center-mounted fuel tank, the Fit will be able to achieve best-in-class space with class-leading cargo capacity. Compared to its closest competitors like the Nissan Versa and Ford Fiesta, the Fit has more front shoulder room, rear legroom and passenger volume. 4) New Standard Features: Honda didn’t want anyone to just settle for the Fit, they built it in such a way that it would be competitive to the next class up, which would be the Honda Civic. Features that will be sure to blow you away are new LED brake lights, auto on-off headlights, smart entry push button start, moon roof, Bluetooth HandsFreeLink and center storage console with armrest. Probably one of the most exciting new features is the all new heated leather seats available for the first time in the Fit. And there you have it. 4 reasons that will make it hard for you to say no to the new love of your life, the 2015 Honda Fit. With strong fuel economy, a quiet cabin, cargo flexibility and exciting new features, Honda has made it very easy for you to fall in love. The 2015 Honda Fit is coming soon to Airport Marina Honda – call us to find out more information, so you can be among the first to know when they arrive! 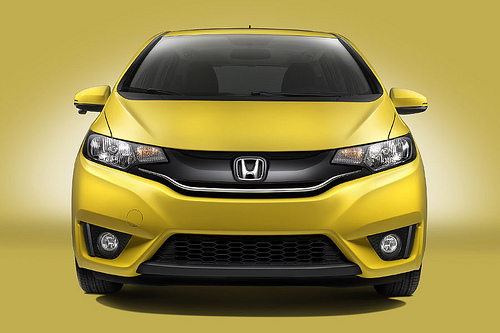 What are you mostly looking forward to in the new 2015 Honda Fit? Please note: We do not currently have inventory of the 2015 Honda Fit. However, you can always call Airport Marina Honda to find out the most recent information on the arrival of this new, exciting model!